The most important things to consider when purchasing a protein skimmer are performance, reliability, and durability. 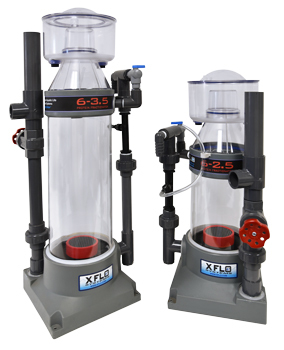 XFLO Protein Skimmers combine all the above to deliver one of the most innovative protein skimmers available today! Don’t be fooled by sleek looks, gimmicky twists, or exaggerated needlewheel performance! If a protein skimmer looks good and doesn’t perform, how good is it? Why use RK2’s XFLO skimmers? RK2 set the bar for protein skimmers in the public aquarium and aquaculture industries and has been the industry standard for over 25 years. Now you too can use what the professionals use! Let’s take a look at what makes the XFLO skimmer stand out from the ever varying protein skimmer designs in today’s market. A uniform 6” diameter reaction chamber allows for proper flow rates and contact times in comparison to the design of cone/hourglass/curved skimmers that actually reduce contact times and decrease skimmer efficiency. This sends water from the top of the reaction chamber down through the rising bubbles to create a counter current, stripping action that allows maximum soluble organic removal. 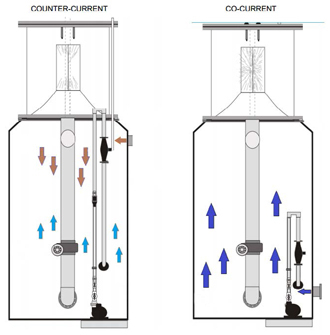 Counter Current design also allows for better mass mixing of air and water increasing skimmer efficiency. Most other skimmers, needlewheel included, are Co-Current which injects air and water into the bottom of the skimmer which all travel upward in the same direction. Co-Current skimmers have been proven to be inferior in design to counter current skimmers. No need to raise or lower the skimmer or try to build weirs to control the water level inside the sump. No more finicky “sweet spots” for water levels. You won’t need to worry if your sumps water level fluctuates that your skimmer will flood, or not perform at all. These plates inside the riser cone stop circular swirling of the water and foam head, and create a “ladder effect,” pushing the foam upwards to be ejected from riser cone into the collection cup. This displaces less water inside the reaction chamber and allows for greater contact time with the “dirty” water. It also allows for a lower injection point of the bubbles, which increases contact times as they rise inside the reaction chamber. The domed lid allows foam to roll away from the center and drip to the edge of the riser cone and into the collection cup. Through this process, we prevent foam with trapped organics from collapsing back into the reaction chamber, thus increasing our collection capabilities. The lid also features a vent for air/ozone of gassing. Sealed with a simple o-ring that allows for easy removal for cleaning with no union to break apart or thumbscrews to undo. A red cover for the riser in the cup ensures no skimmate spills out while carrying. The cup also features multiple options for skimmate draining/removal, allowing for versatile installations. Quick, simple, and does not require tools. The collection cup and lid separate from the rise tube by just a simple lift. The riser cone has a twist lock connection to remove for easy cleaning of the cone. The baffle plates easily slide out for cleaning and for access to the reaction chamber body. The XFLO has the ability to be installed in or out of the sump. A submersible or even an external pump can be used which offers an array of installation possibilities. Included is a flexible hose that allows for versatile skimmer/pump locations. Discharge outlet Tee rotates allowing for more configurations. XFLO skimmers don’t lock you in to using a proprietary pump. You can pick a pump right from the shelf of your local fish store. If you have a preferred brand, you can use their pump as long as it fits the performance criteria. For a list of recommended pumps, please see the model charts for a good, better, and best recommendation. From materials, to research and testing, RK2’s XFLO skimmer was developed and designed with a higher standard in mind. XFLO is made from the highest quality materials available. Our molded bases are made from High Density Polyethylene (HDPE) that doesn’t require gluing or bonding to fabricate. The reaction chamber is made from a single section of acrylic tube. The riser cone, collection cup, and collection cup lid are made from nearly non-breakable polycarbonate material and our Mazzei Air Injector is made from highly durable ozone resistant Kynar. This guarantees it will not break down when exposed to ozone. XFLO has been tested and designed to run at specific levels of air injection. Don’t believe that the more air/bubbles you inject the better the skimmer will perform. The concept of increasing air flow while increasing contact times is scientifically impossible. Too much air, and the reaction chamber only fills with foam, which displaces water and decreases bubble contact time with “dirty” water, along with the true tank turnover rate. RK2 Systems, Inc., the parent company of XFLO, has been the industry standard for over 25 years in the public aquarium/zoo sectors. We’ve taken their knowledge and applied it to making a protein skimmer designed for the home aquarium. XFLO Skimmers are designed and manufactured in the USA with the highest-quality materials in the industry.